Alpacas of Tealwater Ranch, LLC est. 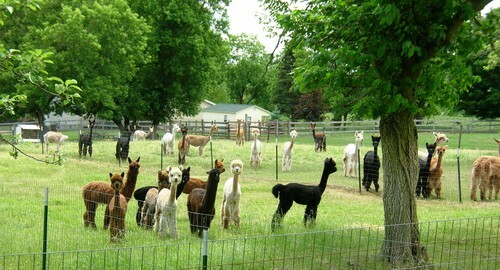 2005 is an Alpaca Farm located in Vermontville, Michigan owned by Cora Foley . The alpacas all have new homes! 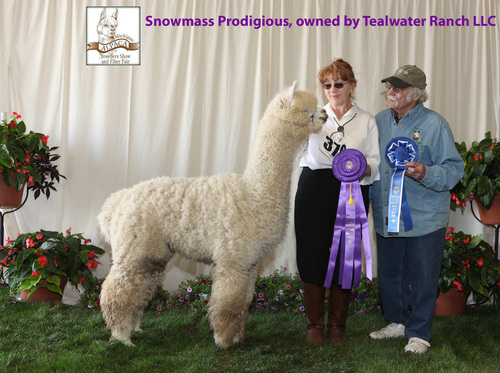 April 2019: Thank you Marcus Irrthum of MN, the new owner of the Alpacas of Tealwater Ranch Herd! The farm may be up for sale later this year. Events: Thank you to all who visited Cora's booth at FIBER EXPO (www.fiberexpo.com) in Ann Arbor, MI held at the Washtenaw Farm Council Fair Grounds. April 26, 27, 28 - come to the Vermontville Maple Syrup Festival! 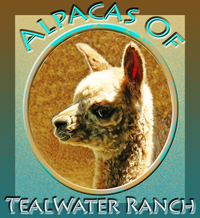 If you're looking for one of the Tealwater studs or to purchase some foundation stock contact me for referral to the new owners of the Tealwater Ranch alpacas. 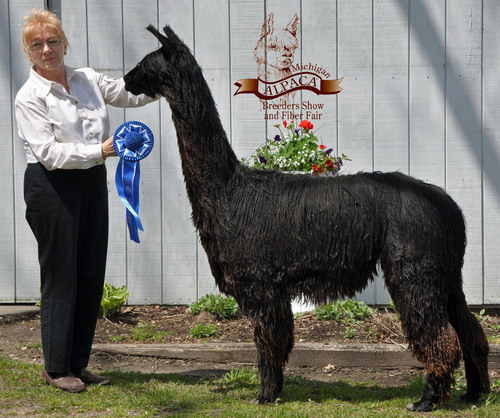 Raising colorful, high quality Huacaya and Suri alpacas for the beautiful fiber they produce since 2005. This herd has the genetic diversity and bloodlines for new breeders to build quality starter-herd packages. We assembled this herd individually through selective investments and breeding decisions. 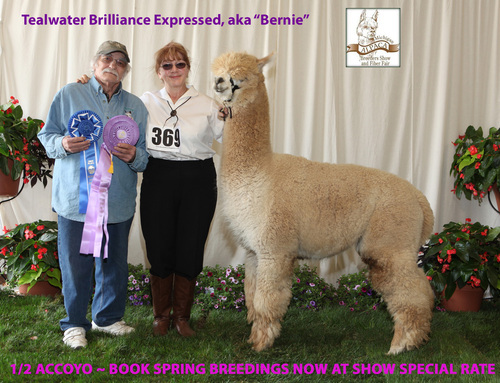 Our choice of studs resulted in over a dozen show champions and ~50 blue ribbon winners on the farm - enough to qualify Tealwater Ranch as "Certified Elite". Why did we sell our herd? Advancing age brought life threatening heart disease - my dear husband Bob could no longer help on the farm and his heart gave out Jan. 18th. 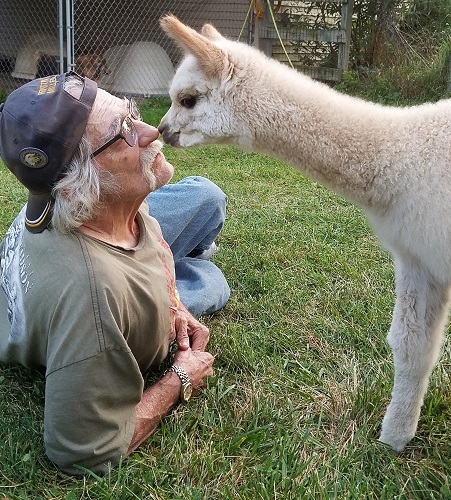 I will remain actively involved in fiber products, alpaca consulting and creating natural fiber fashion, but I had to give up my beloved alpacas. I was blessed to meet several good folks interested in our alpacas - 6 Suris went to start a new line on an existing farm in Illinois, 4 went to new Michigan homes, and the remainder of the herd of 50 alpacas went to Minnesota to form the new owner's foundation alpaca herd on a diversified dairy farm. I still believe my reputation and your trust is earned in every transaction. I still have raw fiber, roving, yarn and finished products for sale in luxurious alpaca - both Peruvian and USA handmade by me.